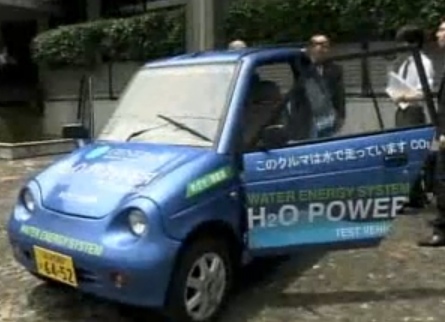 A company in Japan has unveiled a car that runs on nothing but water (or soda, tea, coffee, etc) because it has a built in energy generator that takes the hydrogen from the water that's poured into the car's tank. This generator then converts the energy into electric power to run the car. This one is really small and runs for an hour at 50 mph with a liter of liquid (equivalent to two cans of soda). The company's name is Genepax. The amazing part is that you don't have to charge the batteries. With this technology there is no longer a future for the oil industry, nuclear plants and the electrical grid.